Plants may not have a cerebral cortex, but that doesn't mean they haven't evolved effective forms of alternative intelligence. As a recent study of the Barberry and its parasites shows, some plants exhibit a form of memory — and even anticipate future risks. The European Barberry plant (Berberis vulgaris) has a parasite problem. The tephritid fruit fly pierces through its berries in order to lay its eggs inside them. As the ensuing larva develops, it feasts on all the seeds inside the berry. 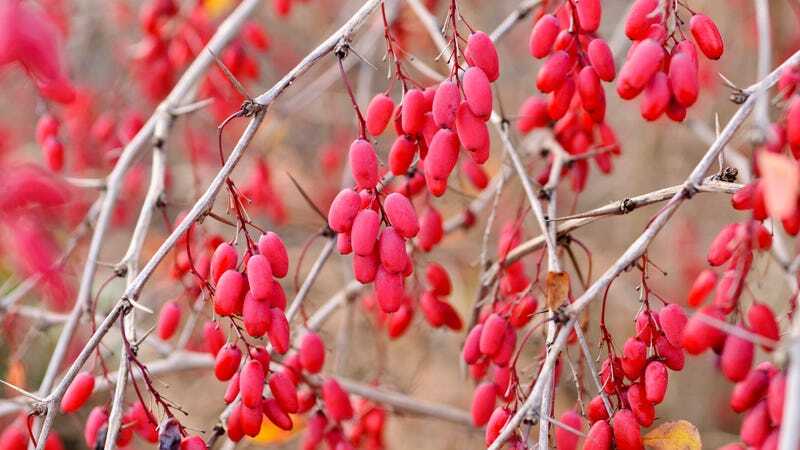 But most berries have two seeds inside them, and the Barberry is able to halt the development of its seeds as a means to save its resources — what botanists are now calling "selective seed abortion." The Barberry uses this mechanism to defend itself against the tephritid fruit fly. To prevent the larva from getting to the second seed, the plant aborts the infested seed, resulting in the death of the parasite. This is amazing unto itself. But according to scientists at the Helmholtz Center for Environmental Research (UFZ) and the University of Göttingen, there's more to it than that. The seeds of the infested fruits are not always aborted. Rather, it depends on how many seeds are inside the berries. If the infested fruit contains two seeds, the plants will abort the infested seeds 75% of the time in order to save the second intact seed. But if the infested fruit contains one seed, then the plant will only abort the infested seed 5% of the time. "If the Barberry aborts a fruit with only one infested seed, then the entire fruit would be lost. Instead it appears to 'speculate' that the larva could die naturally, which is a possibility. Slight chances are better than none at all," explains Dr. Hans-Hermann Thulke from the UFZ in a statement. "This anticipative behaviour, whereby anticipated losses and outer conditions are weighed up, very much surprised us. The message of our study is therefore that plant intelligence is entering the realms of ecological possibility." The Barberry, it would appear, has evolved a strategy where it's able to adaptively and selectively abort its own seeds to prevent parasitic infestation. It's considered the first ecological evidence of such complex behavior in plants, showing that they're capable of structural memory, the ability to discern between inner and outer conditions, and anticipate future risks. Read the entire study at The American Naturalist: "Adaptive and Selective Seed Abortion Reveals Complex Conditional Decision Making in Plants."